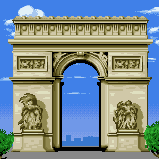 The Arc de Triomphe (occasionally misspelled as the Arch de Triomphe) is a monument in Paris appearing in Mario is Missing!. A Tomb of the Unknown Soldier is located at the building's base. The Eternal Flame burning there is stolen by Koopa Troopas during the events of the game, and Luigi is tasked with getting it back and delivering it to the arch. Upon returning it and answering some questions to prove its legitimacy, he is rewarded a prize of 1,750 dollars. Who ordered the arch to be built? Who is responsible for rekindling the torch at the Tomb? The Arc de Triomphe (Arch of Triumph) was built by the architect, Chalgrin, on the orders of Napoleon. It honored the French Empire and the triumph of the French armies during the Revolution. Napoleon died before the structure could be completed in 1836. A small museum inside the arch commemorates both the history of the great general and the building itself. In 1920 the arch became the sight[sic] of the Tomb of the Unknown Soldier. Every evening at 18:30 a delegation from the Old Soldiers Association rekindles the tomb's torch. This page was last edited on November 11, 2018, at 19:29.